Description: Went on a patrol this morning with Private Ainsley McKenna. Seen here, you can tell we went out equipped in our Winter Gear, as the actual temperature was 1 degree Fahrenheit (-17 degrees Celsius), with a windchill approaching negative 10. Ainsley was wearing her full dress Battle Scottie Uniform, as supplied by Scottie Logistics – Southern Division (B. Murray- Australia). I have lost far much to weight to wear my dress uniform from Ms. Murray, so I had to wear just a conventional sweater. Even then, it just hanged off me. 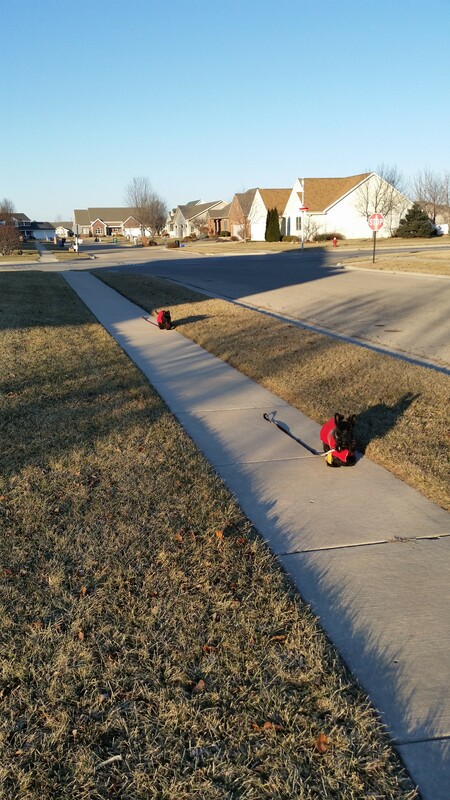 Normally, as you know, I mock Scotties that wear their sweaters when it is like 40 degrees, but once we approach zero, we appreciate the warmer gear. Enemy Encounters: None. Very quiet. We did get barked at by the Yorkies from their position in the front window of the next door house, but they are not hostile. Just stoopid. Unless an emergency arises, my next communication will be in 2015. It is cold in OK too but not that bad. Carry On. No one believes the weather CAN be Ok in Alaska! 35 above again today. It is unusual this time of year. BUT!! Still 35. All the best to you and Staff in 2015, Angus Fala. Thanks for taking that cold walk on behalf of your Scottie Nation. Thank you and pvt. Ainsley for your continuing patrols , keeping us safe even in 1 degree weather. Carry on the good word.